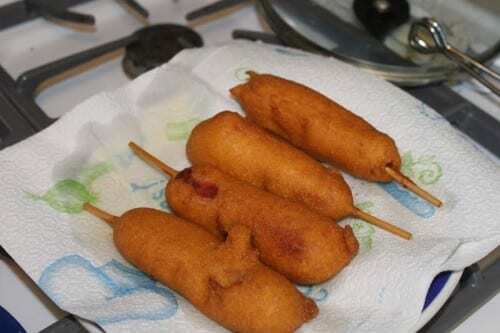 How to Make homemade corn dogs that taste like they’re straight from the fair. A dinner idea for the whole family! Easy DIY Recipe Tutorial Idea. I am not a huge corn dog fan, but while we were on vacation last week, we ate several different types of corn dogs and they were all so amazing! We had the big “state fair type” corn dogs, the simple corn dogs from corner trollies, and my new favorite, hot dogs wrapped in pretzel breading. AMAZING!! Since vacation is over our life has returned back to boring and I am finding myself craving all the amazing corn dogs that we ate. So in desperation, I went to a favorite recipe of mine and have been making delicious corn dogs at home. I have been reminded of how yummy this recipe really is and thought I would share it with you. In a medium bowl, combine cornmeal, flour, salt, pepper, sugar, and baking powder. Stir in eggs and milk. For my corn dogs, I used the cheap hot dogs, but I bet if you used the better quality hot dogs (yes there is such a thing as a good quality hot dog) these would be even better! 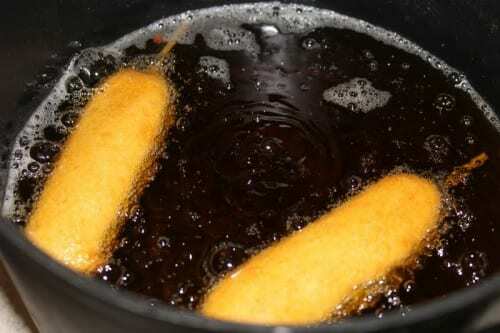 SAVE HOW TO MAKE DELICIOUS CORN DOGS TO YOUR FAVORITE RECIPE PINTEREST BOARD! This looks so yummy! I’m have a recipe only link party “Cast Party Wednesday” and this would be perfect. Would you come over and share some of your recipes with us? Forget grilling the hot dog for the 4th – we should have these! I am new to your blog and foudn you through night owl crafting. Would love a follow back. Come see me at http://www.cookieandclaire.blogspot.com if you have time! Thanks for the fried food craving! Yum! These look just like the state fair ones! Now I watn a corn dog! I LOVE your blog! Following from the Tuesday Time Out Link Party. Yum. My son would love these. Thanks so much for linking up to Made With Love! I’m featuring this on my FB page today! yummm those sound sinfully good! de-lish! Thanks for linking up to Mad Skills Monday! LOVE your blog! I’d be so happy if you came over to Lovely Little Snippets and linked up with us! Corn dogs are the best, especially those footlong ones you can get at the state fairs!We would love to have you link up at our party, Crafty Lassie Tuesday. we are also having a giveaway!! Hope to see you there. I’m not a big corn dog fan either but homemade? I’m so in! They look delish! Oooh these look delicious! I loovvvee corn dogs but can never bring myself to buy them at the store! I’ll have to try making them instead! These look delicious but I have to admit that I have never once eaten a corn dog. lol Thanks for sharing at our party this week. Yum – we’ll have to try those! Visiting from Happy Hour Projects! Oh my gosh! YUM! 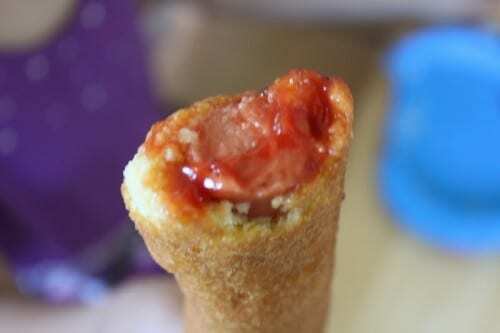 I’ve never made corn dogs, now I totally want to! Thanks! Hubby loves hot dog so I had planned to grill some for dinner. After seeing this post, we are so having corndogs! Thanks for sharing. Visiting from Adventures of a DIY Mom. I’ve seen corn dogs in the movies and always wanted to try them, I shall have to give this a go as my mouth is watering just reading it! I had no idea what a corndog was so it was great to see. We call them dagwood dogs in Australia however there may not be cornmeal in ours. Thanks for linking up to Flashback Friday Blogshare!